Under the leadership of Te Whiti and Tohu, Parihaka Māori began a ploughing campaign to protest against European settlement on land confiscated from Māori. Located on the lower slopes of Mt Taranaki near Cape Egmont, Parihaka became a centre of peaceful resistance from the mid-1860s. The movement involved not only neighbouring tribes, but Māori from around the country. At Parihaka, Te Whiti-o-Rongomai and Tohu Kākahi began a campaign to resist European settlement on land confiscated from south Taranaki Māori who had fought against the government. This campaign used non-violent methods. In 1879 the government started surveying confiscated land on the Waimate plain, south-east of Parihaka. Te Whiti’s followers disrupted these surveys by ploughing and fencing land occupied by settlers. Many were arrested and held without trial in the South Island, but the protests continued. 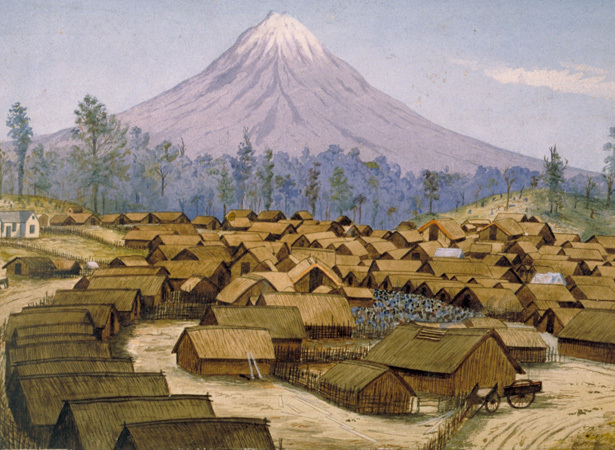 In November 1881, the government sent more than 1500 troops to Parihaka. Most of its inhabitants were arrested or driven away; Te Whiti and Tohu were imprisoned until 1883 and the village was demolished. Despite the absence of its leaders, Parihaka was rebuilt. Ploughing campaigns − and arrests without trial of protestors − continued into the 1890s. We have 6 biographies, 1 article, related to Parihaka ploughing campaign begins.